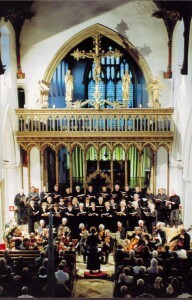 The Eye Bach Choir was founded in 1974 by Merlin and Ann Channon. It has nearly fifty singers and a tradition of excellent performance. Although we honour J.S.Bach in our title, our repertoire covers works from the sixteenth to the twentieth century. It ranges from Byrd to Britten and Tippett; from Bach, Handel and Mozart to Mendelssohn and Brahms as well as Monteverdi, Pergolesi and Vivaldi. We engage professional soloists and when required bring together the Eye Bach Choir Orchestra consisting of prominent local musicians and teachers several of whom have been with us for many years. “The Eye Bach Choir is sociable, highly articulate, and has a wonderful spirit!” says our founder.